Beautifully engraved specimen certificate from the Scottish Inns. This historic document was printed by the Security-Columian Banknote Company and has an ornate border around it with a vignette of an allegorical woman between two globes. 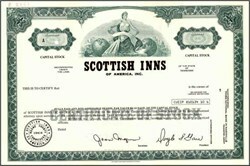 Scottish Inns of America changed its name to Vacation Spa Resorts in 1981.